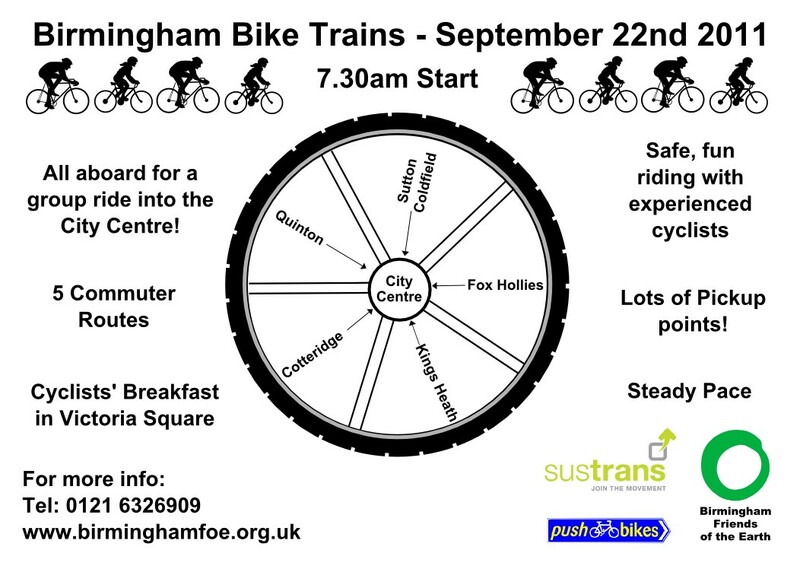 On the 22nd September 2011, Birmingham Friends of the Earth in conjunction with PushBikes and Sustrans will be holding 5 “Bike Train” events. This is an opportunity for people to get out on their bikes for the commute to work. It is the annual Car Free Day, so they want people to leave their cars at home and join a “Bike Train” to work. Birmingham Bike Trains will be running along 5 routes into the city centre (Victoria Square) in time for people to get to work. There will be a breakfast at the end. For a map of the routes, as well as to register, please follow the link below! This entry was posted in Events and tagged Acocks Green, Bike Train, Cycle to Work, cycling, Fox Hollies, friends of the earth, September 22nd. Bookmark the permalink.